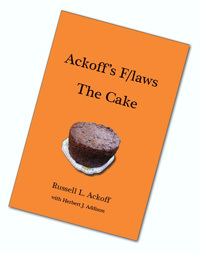 New book: Ackoff's F/laws: The Cake by Russell L. Ackoff (with Herbert J. Addison). Russ Ackoff’s witty and subversive 122 F/laws of Management are widely respected and cover areas like hierarchy, teams, innovation, motivation and management. This book brings them together in a single source. Published by Triarchy Press, 15 March 2012 (156p) List £35.00. Available hardback and Kindle through amazon. For more details see http://www.triarchypress.com/pages/The-Cake.htm. Each f/law comes with a page (or so) of Russ Ackoff’s own explanation and illumination – often wandering into delightfully unexpected areas. This is the first full collection of all Ackoff’s f/laws – previously only available in two separate books from Triarchy Press (Management f-Laws and Systems Thinking for Curious Managers.) This hardback collection reverts to Ackoff’s original typescript without any commentary or other introduction and features some of his original cartoons. "Over time I have become aware of some very important truths about the practice of management. These truths, which I call the ‘F/laws of Management,’ contradict assumptions that are commonly held by managers. These simple management truths are much more important than the fundamental, but complex, truths revealed by scientists, economists, politicians, or philosophers. The truths these wise thinkers reveal are at most frosting on the cake. The truths presented here are the cake."